AMC's Great Kids, Great Outdoors: “Let’s go hiking. Let’s go shopping.” Three generations of mothers and daughters. “Let’s go hiking. Let’s go shopping.” Three generations of mothers and daughters. During their weeks at the camp, Chris’s father and brothers hiked one of the peaks in the Squam Range every morning, while Chris’s mother explored the area’s antique and craft shops. Sometimes her mother joined a hike, but to Chris she seemed more at home in high heels than in hiking boots. Chris alternated between parental passions: one morning hiking with her father, the next morning shopping with her mother. Chris took her daughters on their first girls-only camping trip when Annie was in kindergarten and Nat’s schedule didn’t match the school vacation. Chris drove two days, to a trailhead along the border between Tennessee and North Carolina. She wanted to share a special spot along the Appalachian Trail, a place called Grassy Ridge, with her daughters. They never got there: On their first night in the tent, a storm came through and hit their exposed campsite with thunder, lightning, freezing rain, and heavy winds. Mother and daughters hiked out the next morning. Chris persevered, though, and the all-girl camping trip over spring break became a tradition. “I carried my belief like a torch,” Chris says now of her determination to take her daughters hiking. “Partly it was just me needing to get out.” But she also wanted to keep her daughters from getting caught in the traps that adolescence often sets for young women. “Wearing the dumb shoes” is her shorthand for the kind of paralyzing self-consciousness that makes girls obsess about how they look or wear clothing that's fashionable but not functional. Elizabeth was 13 when she asked her mother, “Can’t we just go shopping?” instead of hiking. But they went. Chris bribed her into one last trip at age 15 by offering to end a hike in the Presidentials with a trip to the outlet malls. When Elizabeth no longer came on the camping trips, Chris and Annie backpacked with a friend of Annie’s and her father. When the friend decided that she hated hiking, Chris and Annie continued alone. By this time, mother and daughter could carry the same weight and keep the same pace. The decade-long string of mother-daughter hiking trips ended in 2008, just before Annie’s senior year of high school. The year she graduated, college applications bled into a summer job. Chris didn’t bring up hiking — “She didn’t ask and I didn’t offer” — and then Annie was gone. Chris’s mother is 80 years old now and still dresses with great flair. Not long ago, she took Chris clothes shopping, and daughter enjoyed letting mother pick the right outfit for her. Just before Mother’s Day, Chris received an email from Annie. She asked her mother if they could set aside some time to go backpacking later in the month, after she’s home from college. “It’s been too long,” she wrote. 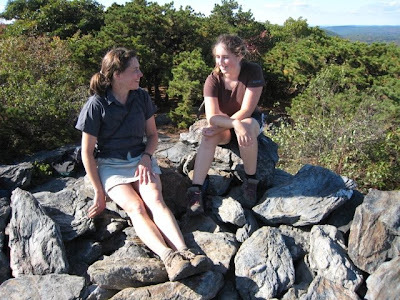 • Read Christine Woodside’s essay about hiking with her daughters, “Mom and the Girls, Taking the Upward Trail” (New York Times, January 30, 2009). • Learn about Appalachia, the longest-running journal of mountaineering and conservation. Photos: Mother and daughter on Bear Mountain, Connecticut; Elizabeth and Annie. Christine Woodside collection.